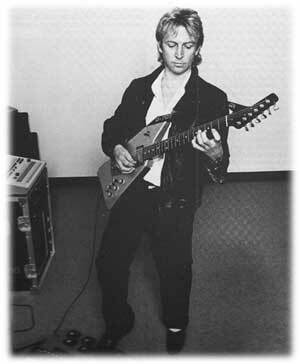 Andy Summers’ exploration of guitar synthesis has been documented on the Police’s Ghost In The Machine [A &M, SP-3730], as well as on his collaborations with Robert Fripp, I Advanced Masked [A &M, SP-4913] and Bewitched [A &M, SP-17299]. His Roland system continues to play a prominent role in his studio projects. If you’re a guitarist, you should not be intimidated by using your instrument as a synthesizer, but you shouldn’t feel that you have to own one, either. If you can ever afford it, it’s something that you can use in your armory as another tool. But I don’t think there’s any point in competing with keyboard players or anything like that. It’s just a matter of where you can use it. At the moment, I still do most of my work on guitar, and I employ keyboards, as well. I use a guitar synthesizer for certain sounds or if there are particular passages I want to play that I can’t really pull off on a keyboard; I have more facility on the guitar. For me, the guitar synthesizer is a great writing instrument. I certainly find composition is often inspired purely by sound itself, and having all those sounds under your fingers can be a fantastic aid to inspiring writing ideas. If I’m playing a violin thing, for instance, I tend to respond to that sound with the way I finger. Even if I don’t end up executing it all that way, I find it a very useful instrument just for that point of view alone. The most obvious thing you can’t do with a guitar synthesizer is to really sound like a guitar. They are two different instruments, so why even confuse the two? It happens to be a guitar synthesizer, so use it that way, in its synthesis mode. I wouldn’t even want to try to use it like a guitar. On the other hand, it sometimes feels very peculiar to play certain non-guitar things with it - piano patches, for instance. I don’t like doing that. Other things feel better. My favorite sounds are the high, spacey ones that are very ambient. They’re the most distinctive. They don’t sound like other instruments, like second-rate keyboard sounds. I’ve been into guitar synthesis for about five years now. By the second album [the Police’s Regatta De Blanc, A&M, SP-4792]1 had bought the original Roland GR-500. We were working so hard on the road, though, that I didn’t really get a chance to get into it. Later on, I used a Roland GR-300 for a couple of numbers every night in the Police show - "Don’t Stand So Close to Me," as well as material from the fourth album [Ghost In The Machine]. More recently, I used guitar synthesizer extensively on the two albums I did with Robert Fripp. I was particularly pleased with the sounds that I got on Bewitched. 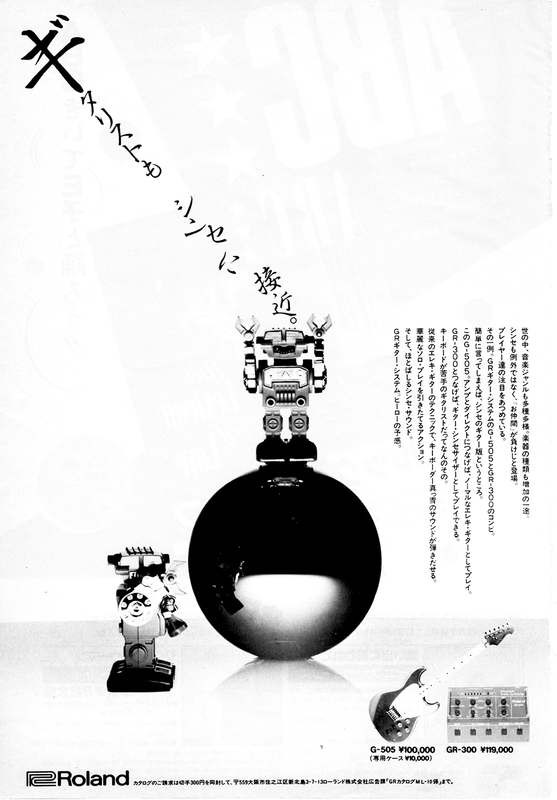 The whole melody of the opening track was played on the guitar synthesizer, a beautiful sound. There’s an example of where the tune was written directly from having that sound. It’s all across that album. I’m working on my own solo vocal album at the moment, and I’m definitely going to be using the guitar synthesizer there. Straight away afterwards, I’m going to record an ambient album, so I’ve use a lot of it on that, too. There was also one on a few places of the soundtrack I did for Down And Out In Beverly Hills, but that was more straight guitar. The Roland system is still my favorite. I tried a SynthAxe three years ago, and I didn’t like it. At that time, you had to have a Fair-light [synthesizer] to make it sound any good at all. You were in for a minimum of like 30 grand. 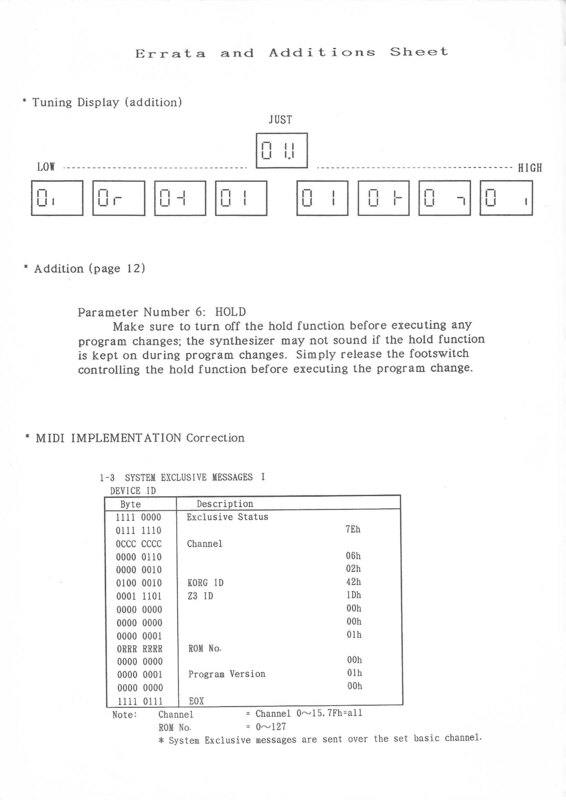 They wanted $10,000.00 for the Synth-Axe, as I remember, and then it was about $25,000.00 for the Fairlight. So, it was an extremely expensive and rather ugly instrument. I was much happier with the Roland GR-303 because I could wail on that, and it had a character of its own. It’s been very hard for the guitar as a serious synthesizer to compete with keyboards. Generally, this is because the sounds that you can get on it haven’t been anywhere near as good as keyboards, unless you play it through a Yamaha DX7 or whatever. Then you still have the problems of tracking. I must admit, though, it’s much more impressive than it used to be. I recently had my Roland GR-700 completely updated with all the latest software, and its tracking has now come up almost to where the Roland GR-300 was, so I’m quite pleased with that. I’ve got some great new sounds out of it. I continue to use my original Roland guitar. I used the G-707 guitar for a bit, but I’ve gone back to using my 303 - the brown one. We’ve tried linking my system via MIDI to other synthesizers, but I haven’t really done a lot with that. To be honest, I go to the keyboard when I want to do that. With the guitar synth, I usually use some external effects, such as chorus and echo, and sometimes compression. This is just to open it up a bit. I usually use it in stereo, anyway. I put it right through my pedal board into a stereo amp. I like to use two Roland JC-120s, because they’re real clean and hard. They suit guitar synthesizers almost more than the regular. If the guitar synthesizer is really going to stand as a synthesizer on its own, it needs to develop a more characteristic sound; I don’ think it’s gotten there yet. But we’re getting there. Right now, there is a sort of reversal of values in the whole guitar synthesizer area There are some strange things going on. I went to see a well - known, nameless jazz guitarist recently who played guitar synthesizer, and he spent at least 45 minutes of his concert making his guitar sound like a harmonica. I found it rather odd that with $100,000.00 worth of equipment, he was making a guitar sound like a $5.00 instrument. It’s very strange to watch somebody doing that. It’s not as thrilling somehow, and it’s a little disturbing. I imagine that in the far future guitar synthesis will become very sophisticated. The irony for me is that strings and frets don’t seem to be geared for synthesis. There seem to be so many inherent problems in having a piece of wire bouncing over a bit of wood with metal through it. Unless they can control that more, I don’t know how good it will ever become. You’re never going to have the control like you do with a keyboard. In the end, maybe someone will make a breakthrough in the string and fret arrangement that will change the whole thing. But if that does happen, I wonder if it’s even going to be a guitar anymore.